Well it’s almost that time of the year again. 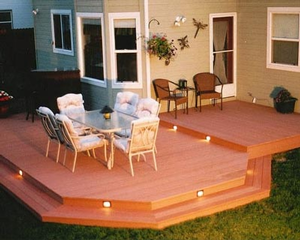 The snow and ice will be melting off your decks and for many of you so will your deck coatings. So you have a choice, do the same thing you do every year, strip and repaint or just repaint or reseal with that same clear sealer. All of which doesn’t work. So why not try something different? ArmorGarage’s Renew It Coating is not a paint, stain or sealer. It’s a super thick cementitious coating that will stick to your concrete or wood decks like glue and stay looking new for many years. Off the shelf paints, stains and sealers are just not hearty enough to last as long as you want and need them to. So strip off whatever you have on your deck now or should we say strip off whatever is left of whatever you have on your deck now. Then apply our deck primer and let that dry. Next apply two thick coats of Renew It with our special rollers and see how beautiful your deck can look and stay looking that way. The key to good results is to clean your deck really good, you want the primer going directly on and into the deck surface. Then make sure the temperature will be above 50 degrees for the next 72 hours and no rain for the next 24 hours. Then roll on one coat and let dry for about 4 hours till hard to the touch. Then roll on the second coat. Don’t try to stretch it out, Renew It goes on really thick. That’s how in fills in cracks and holes. So it coats and repairs your deck surface at the same time. You should have approximately an 1/8” costing on the surface. Any rotted boards should be replaced. You should replace them with untreated boards and give them a rough sanding prior to priming. So give Renew It a try and take next spring off from deck chores! Thanks so much for all the info you put into your website. I just want to let you know that your products work as advertised. Used your Renew It deck coating and I haven’t had to strip and repaint my deck this year! Not only hasn’t it peeled off it still looks like the day I did it. WOW!